(Edit the remoteRoot option to reflect your app). Note: In some (non-Django) cases line-by-line debugging does not work, unless you use double backslashes (\) in your remoteRoot parameter (Viscual Studio Code), even though the remote server runs on Linux. E.g. "remoteRoot": "\\remote_root\\of\\your\\app"
There have been some problems reported regarding remote debugging from Visual Studio Code using ptvsd > 3.0.0. The issue mentioned most often is that VSC 'just hangs' when trying to connect to your remote debugger. Another problem can be caused by using ptvsd.wait_for_attach(). This can lead to the same problem as described above, where VSC just hangs while connecting to the remote debugger. Try replacing wait_for_attach() with a simple time.sleep(10) and connect within the 10 seconds. Yet another problem can occur when using forward slashes in your launch.json. 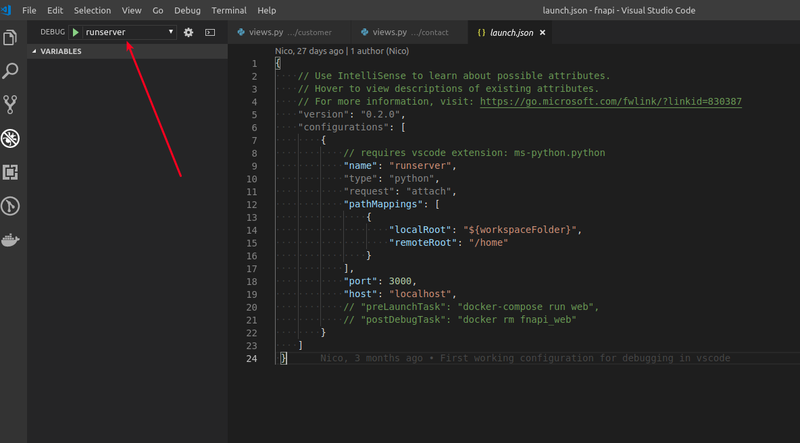 that's it, you are debugging in vscode ! Thanks @lebnic, that was helpful too. The approach I've settled with is calling python -m ptvsd from the command line instead of embedding it in manage.py. "command": "docker-compose run -d -p 3000:3000 -p 8000:8000 --rm web bash -c 'python -m ptvsd --host 0.0.0.0 --port 3000 --wait manage.py runserver --noreload --nothreading 0.0.0.0:8000' && sleep 5"